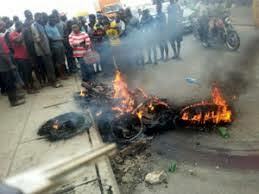 Uyo—THREE suspected robbers were, yesterday, burnt to death in Uruk Usung community, Obot Akara Local Government Area of Akwa Ibom State by youths. It was gathered that the victims of the jungle justice were caught while trying to rob some residents. 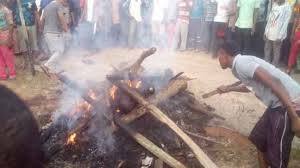 It was further gathered that the suspects appeared to come from outside Obot Akara Local Government. A source disclosed that the three suspects, who were beaten thoroughly before they were set ablaze, were in their late twenties. According to the source, “I was told that those boys were among the robbery gang that had been terrorising the community for some time now.